Spin Rewriter - Is the content high enough quality? Everyone knows high-quality content is a must if you want to rank on Google. But hiring content writers is expensive and writing a million articles yourself is impossible. Enter Spin Rewriter - a tool that saves you time and money by automatically rewriting articles for you. Spin Rewriter does a very good job writing content, but there is still one problem. Spin Rewriter rewrites with the text it is given, so if the content you enter has any mistakes... Spin Rewriter can only do so much. That’s why we developed a Perfect Tense integration directly in Spin Rewriter. When integrated, Perfect Tense will fix any spelling or grammar mistakes in your content before it is spun so that your spins will be higher quality. In addition, Perfect Tense will proofread your content after it is spun so you can rest easy knowing that your Spin Rewriter content will be error-free and high quality enough to rank! In just one click, Perfect Tense will proofread your article and show you all of the different ways it can be improved. Then in just one more click, Spin Rewriter will automatically apply those changes to your original article! And you get back a completely grammatically correct article without having to do any proofreading or editing yourself. This is important because even the best spinner will struggle if your original article has mistakes. So by using Perfect Tense before you spin, Spin Rewriter and it’s ENL algorithms will have an error-free article to work with, which means you can get spun articles that are even higher quality than the original. Perfect Tense is also integrated after you spin so you can make sure your spun articles are mistake-free before you use them. So if any mistakes snuck in during the spinning process, Perfect Tense will correct them and make sure your final spun output is high quality. 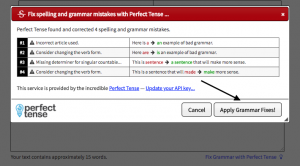 Just click “Fix Grammar & Spelling” and Perfect Tense will make sure that your spun content is ready to publish. It’s 2018, and you need higher quality content than ever if you want to rank. But that doesn’t mean you have to spend a fortune on content writers. Using Perfect Tense with Spin Rewriter is a perfect match because you can slash your writing costs and save countless hours of editing, all while knowing Google will love your content! Try Spin Rewriter for free today and start taking your content to the next level!